This colorful and fitness novelty sock is the perfect gift for fun loving wild and crazy persona. The various artwork designs in one pack are perfect for any fashion forward girls or boys to wear to school, party, or special event. Novelty/ Crazy /Cute- Brighten up your day! Various fashion images, including American Flag, Shark, Boots, Chicken Legs, Elk, and Snowmen add a Unique Punch to Any Outfit, from Dressy Suits to Casual jeans. The flag socks also can be Independence Day socks. Patriotic cool FOR LESS! No sweat! Show your spirit in every step. Sublimated Stars and Stripes pattern adds long-lasting style- perfect gift item. The Chicken Cluck Legs socks make your legs look leaner. This is must have for all women. You'll release individuality with Shark socks and boots socks. Amazing Comfortable- Your Feet Will Thank You! Made of 80% cotton so is soft and easy to wear - it is breathable, absorbent, and deodorizing! Each pair of these socks are made of 18% elastic spandex material so they are not too loose or too tight fitting; perfect fit so you stay comfortable and keep your feet wrapped up. We have 100% Positive Feedback on our Products and are certain these are the Quality Socks for you! Check out our Amazon store for many more amazing designs & patterns! ARTWORK&DESIGNS: Plain, Funky, Nations, Seasons (Mother's Day, Independence Day etc. ), Pattern, Humor, Animals, Textured and Many More! Adult novelty cute casual daily cotton socks, perfect for your fun loving wild and crazy persona. OCCASIONS: Soft Materials and Cute Design especially suitable for Christmas, Halloween and various kinds of Parties. 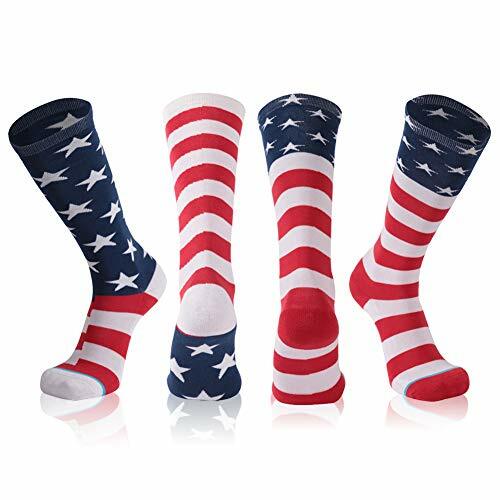 National Flag Day socks are suitable for Independence Day or other special national days. Grab these for great value! These also can be dress or casual socks. PERFECT GIFT: Various colors and patterns, suitable for daily casual, wedding groomsmen dressier socks, and ideal gift for friends and family. ALL DAY'S COMFORT: Moisture Control, Odor Control, Breathable Mesh, Blister Control, Soft Blend , Premium Endurance, Smooth Seam; Highly elastic and durable, flexible and comfortable, it will fit for your legs. The elastic bands at the top of the socks will not make you feel uncomfortable, and keep you styling all day. SUPERIOR CUSTOMER SERVICE: All Gmark products come with 100% MONEY BACK GUARANTEE. If our Knee High&Mid-calf Gift Socks do not meet your expectation, you can return it to us within 30 DAYS along with your proof of purchase for a hassle-free full refund, e exchange, or replacement. Feel free to contact us via e-mail for any issues encountered during purchase. We will get back to you within 24 HOURS and do our utmost to deliver a timely solution. If you have any questions about this product by Gmark, contact us by completing and submitting the form below. If you are looking for a specif part number, please include it with your message.